Rocket Brewing Co. is one of the newest breweries in Denmark. Their beer has only been on the market for a few months now, and already it's in high demand and forced them to up their production. I myself have tried twice now to procure these elusive brews on my last two trips to Copenhagen. Now thanks to some shadowy connections and back room deals I have all four of Rocket Brewing's premiere lineup. 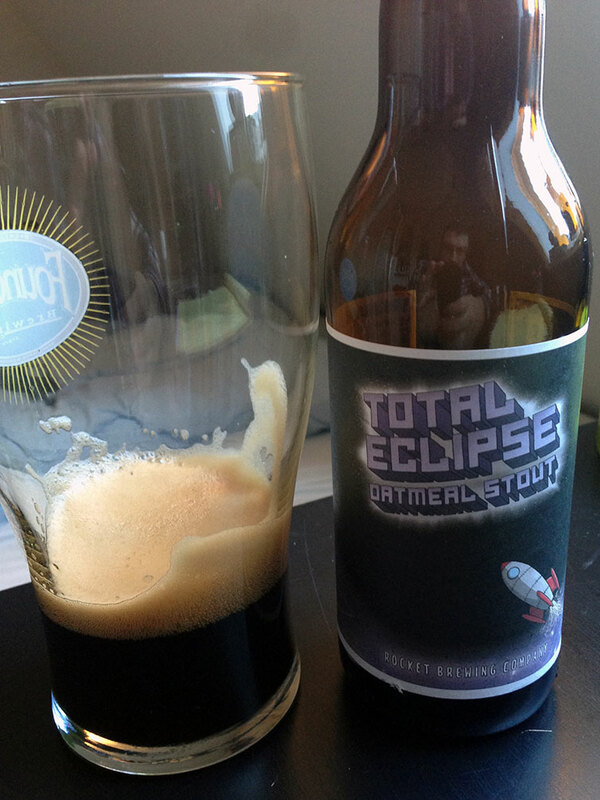 Today's review is their Oatmeal Stout, Total Eclipse. It's aptly named for how dark a beer it is, and at 8.8% it may even make you black out. All the bottles contain a captain's log on the side of bottle. I shall place that on screen for you now sir. Captain's Log: In the farthest reaches of the universe we experienced a phenomenon called Total Eclipse. A Total Eclipse can have different colors and encase you completely to block out all light from the universe. This eclipse came suddenly, turned everything blacker than lack around us, then vanished into thin air a few moments later leaving only the memory behind. Ok number one, review time. Make it so! Poured with a massive head that almost overflowed my glass. Maybe a touch over carbonated...maybe more then a touch. I will say the foam was an impressive tan color and super thick. I probably could have shaved with this foam. The smell was of roasted malt and dark licorice. Very stouty indeed. Taking a taste totally messed up my beards day as I will be wearing that thick foam until my next shower. Very straight ahead stout flavors in this total eclipse. You have your usual list of suspects, mainly sweet-ish dark english licorice and tones of bitter bakers chocolate. I can't shake the idea that it could have done with a nice hit of coffee or a touch more sweetness to balance out the bitter. Mouthfeel is smooth from those oats, but marred a bit by that high carbonation. Impressively the high ABV is hidden for the most part. It is a little warming though, you will not mistake it for a lightweight beer. All in all a decent example of an oatmeal stout if a bit overcarbed and maybe a touch too high in the ABV department for my tastes. I actually look forward to the many variations that Rocket has promised are coming with this beer. It seems like a base beer aching for something more. Maybe I will even get my coffee eclipse.